Air India, originally established in 1932, flies 37 international destinations with its 163 aircraft. Simply the Indian national flag carrier offers low prices yet top quality services to its customers. 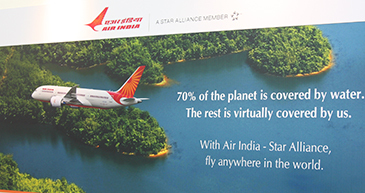 In particular, Air India is part of world's largest global alliance group “Star Alliance." Composed of 28 member airlines it offers over 18,800 daily flights to 1,317 destinations in 193 counties. The Seoul Times has recently met with in his office in downtown Seoul to list to its strengths and competitive edges and what advantages it can offer to its customers. Q1: First of all, Thank you for your time for this interview. 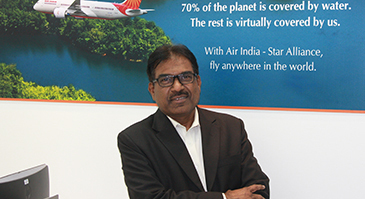 Also sincere congratulations on your inauguration as the country manager in Korea of Air India. Could you please explain about the role of your Seoul office and your role as well? A1: My role here is to take care of the interests of Air India. My designation is Country Manager. We have three offices here. Office No. 1 is at Twin Tee Tower in Jongno-gu in downtown Seoul. This office takes care of passenger sales, reservations and general administration. Office No. 2 is located at Gangseo-gu in western Seoul. It takes care of Cargo sales and operations. Our last office is at the Incheon Airport west of Seoul. Flight operations including passenger processing, engineering, catering are being taken care of. All these three offices will report to me in their respective work areas. Q2: How many flights do you have per week currently? What are they? What about Seoul-Mumbai route? Do you have plans to increase your flights or expand your routes? A2: we have four flights a week. i.e. on Sunday, Monday, Wednesday, and Thursday, respectively. Q3:Who are your customers? How many of them are foreign nationals or local Korean people? What kinds of people they are? What are their nationalities? A3: traffic consists of tourists, business, visiting friends and relatives. And their nationalities are Chinese, Korean, Indian, and other countries. 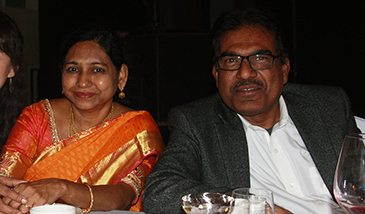 Mr. BA Kishore Kumar (right), Air India's country manager-Korea, poses with his wife (left) and his staff at Diwali festival recently held in the southern part of Seoul. Q5: Do you have any Korean staff, cabin crew members in particular? If so, how many Korean stewards or stewardesses do you have? How do they cooperate with the staff from your headquarters? How do you recruit and train them? Q6: Could you explain about your promotion strategy? Do you hold any events or whatever to further promote Air India’s service to the local people? What are your PR plans? A6: Our primary focus is on FIT tourists, business traffic and pilgrim groups (Buddhists). We participate in major tourism marts organized in Seoul. We conduct workshops for travel agents. We organize familiarization tours to India and Nepal for top tour operators which are generally once a year. A8: There are different kind’s passengers who are … price conscious, time conscious, service conscious, and brand conscious. Based on their interest they will chose the carrier and routing. But I personally feel basic expectation from any airline is SAFETY, On-time performance with reasonable service and convenient connection to final destination. 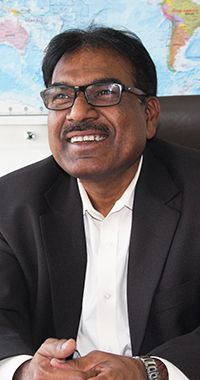 A9: Five years in India Tourism Development Corporation (government of India undertaking). And 24 years in Air India (owned by government of India). Intrinsically, I have personal interest in travel and tourism. Q10: What advice would you give to the young men and women who plan to work in your airline field? A10: For any lay person airline job looks fancy. But it is challenging. For one thing a person who wants to work in any transport industry is that there cannot be fixed timings. Airport job demands to work as per need of the hour. There is no weekend or holidays. Established in 1932 as TATA Airlines and became a public limited company in 1946 under the name Air India. Presently, Air India has a fleet of 163 aircrafts (including two subsidiaries namely “Air India Express” and Alliance Air) flying to 37 international destinations and 69 domestic destinations. Air India is part of the world's largest global alliance group “Star Alliance,“ which has 28 member airlines offering more than 18,800 daily flights to 1,317 destinations spread over 193 counties.